Thanks to its Sustainiac and complex construction, the C-1 FR S SLS Elite is a strong pick. Seriously, where’s the case? We’re spending well over a grand here! Once upon a time, there were three golden rules for builders of shred guitars. One: the whole guitar shalt not exceed the weight of a newborn Daddy Long Legs. Two: when it comes to the neck, anything thicker than a splinter shall be considered excessive. Three: thou must equip said beast with overwound humbuckers that would challenge the magnetic field of an exploded supernova. 30 years on from the original heyday of the shred machine, many of us still hold these clichés to be self-evident. In truth, though, modern rock, metal or shred guitars - however you like to pigeonhole them - are much more complex and diverse than their first-run ancestors. Fresh from the drawing board at Schecter HQ, the Korean-made C-1 FR S SLS Elite aims to knock those old prejudices on the head. For a start, the upscale C-1 FR S SLS Elite tips the scales at around 3.5kg (7.7lb). That’s about the same as your average alder body Telecaster or Strat. Got it? This guitar won’t blow away if you leave a window open. Now let’s take a close look at the C-1 FR S SLS Elite. We’ll shorten that to C-1 from here to save ink and our fingertips. The C-1 has a neck-through body construction. The 648mm (25.5-inch) neck is a multi-ply club sandwich of maple/ walnut/maple/padauk/maple/walnut/ maple. The body end of the neck is formed from a pair of swamp ash wings, an unusual choice for a guitar like this. We expected the more typical basswood. The remainder of the C-1’s physique is formed by an arched flame maple cap. It’s a lovely looking lump of lumber made more spectacular by the Black Fade Burst finish. The blackness intensifies as your eyeballs drift from the cutaways towards the base of the body. The matching headstock adds to the C-1’s upscale vibe. will set all six strings a-trembling, so it can handle chords, too. 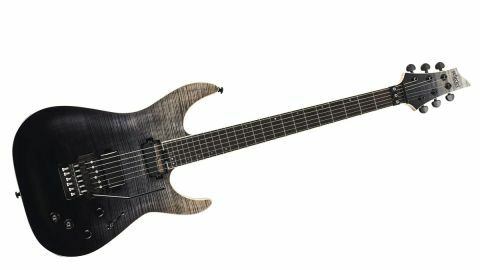 Schecter has paired the Sustainiac with an active Fishman Fluence Modern humbucker. Also direct-mounted to the guitar’s top, the Fluence is available from the manufacturer with Alnico or ceramic magnets. Fishman recommends the ceramic version for the bridge position and that’s what we have in our C-1. If you turn the C-1 body over, then you’ll discover that it has two battery flaps: one for the sustain circuitry, the other for the bridge pickup’s lithium ion power pack. Battery life on the Fluence Modern is quoted as up to 200 hours. That’s 12,000 minutes. So, you should be good for 4,000 three-minute classics, or almost two entire prog rock albums. The C-1’s ebony ’board is brandishing a 305 to 406mm (12- to 16-inch) compound radius. Long story short, it delivers a super-low action and effortless string bending. Sculpting around the cutaways and neck heels also ensures that upper fret access is easy as pie. The star of the C-1’s line-up is the Sustainiac. There are two switches you need to know about. The first toggle simply turns the Sustainiac circuitry on and off. The second switch offers three modes: Fundamental, Mix and Harmonic. The first simply sustains the note or chord that you’re playing. Harmonic generates a feedback-style high-pitch note. The aptly-named Mix is a mash-up of both. Some might view the Sustainiac as a gimmick, but you’d be wrong as it’s a great technique booster. Imagine you’re playing a solo. When you come to the end and want to emphasise the last note you can flick on the sustain circuitry. The note will keep on truckin’. Now, consider how cool it would be to sustain that last note then flick the mode switch to Harmonic. Suddenly, you have what sounds like sweet feedback, in the pitch of your original note. You can also sustain clean chords flavoured with delay, chorus, whatever, for synth-like pads. Reverb-drenched pedal steel licks sound awesome, too, even if a floating Floyd makes them a bit more of a challenge. If Schecter hadn’t twigged us to the fact that the bridge Fishman Fluence Modern had ceramic magnets, we’d have assumed they were Alnico jobs. The deal with these a Fishmans is that they aren’t packed with conventional wiring, and they’re properly noiseless. We like the crystal clear sparkle on tap here, and the fact that you don’t lose that presence when you start piling on the filth. Thanks to the ceramic mags, there’s plenty of output, but you can always hear the tone of the guitar under the thing. That clarity we hear is likely down to the combination of the scale length, stiffened neck, direct-mount pups, and the Swamp ash and maple body woods. Yes, swamp ash is unconventional on this style of guitar, but file us under ‘converts’. We also like the balance between the Fluence and the non-sustaining mode of the neck unit. There’s probably more chance of POTUS Donald Trump getting his face chiselled into the side of Mount Rushmore than the C-1 making the scene at a country gig. That’s not to say that it wouldn’t cut the mustard in such a scenario, but, let’s be honest, it has been typecast by its looks. Then there’s the feel. If you design guitars with skinny necks, fat frets and flatter than vintage fingerboard radii, it’s obvious you’re not trying to entice Joe Bonamassa away from his ’59 Les Pauls. We don’t doubt that this guitar will find the usual punters, but we think it’d be a shame if the rest of you judged it purely on its looks. There are no skulls or other daft graphics. The flame maple and burl tops add a touch of class to the wolf in sheep’s clothing vibe. You can get this model with a hardtail or Floyd, and the pickups are versatile enough to cover most styles. Anyway, the quest for a slim-necked guitar isn’t exclusive to the metal and shredder crowd. Thanks to its Sustainiac and complex construction, the C-1 FR S SLS Elite is a strong pick. That said, it offers a level of performance, tone and build quality that you’ll find hard to beat at its price points. This is one of those occasions you’d be wise to listen - and play - without prejudice.